Abstract: The human amniotic membrane (hAM) has been used in regenerative medicine for many decades in a devitalized form. More recently, however, it became evident that the hAM is a rich source of stem cells. To exploit the regenerative capacity to a full extent, the hAM is now also considered to be applied in its vital form, containing vital cells with functional cell organelles. We investigated mitochondrial respiration, ATP concentrations, lactate concentrations, levels of reactive oxygen species (ROS) and succinate dehydrogenase in two sub-regions of vital hAM, placental and reflected amnion. Mitochondrial respiration was monitored by high-resolution respirometry. ATP concentrations were assessed and lactate concentrations were quantified with a blood gas analyser radiometer. Levels of ROS and succinate dehydrogenase concentrations were measured with electron paramagnetic resonance spectrometry. Placental and reflected amnion differ distinctly in mitochondrial activity, as the placental sub-region of fresh hAM shows significantly higher mitochondrial respiration. Furthermore, we found higher levels of ATP and succinate dehydrogenase in placental amnion. Inhibition of ATP synthase led to elevated lactate levels in placental amnion, indicating increased glycolysis. Interestingly, this switch was not observed in the reflected amnion. Despite higher respiratory activity, we found lower levels of intracellular ROS in placental amnion, however, higher levels of extracellular ROS. 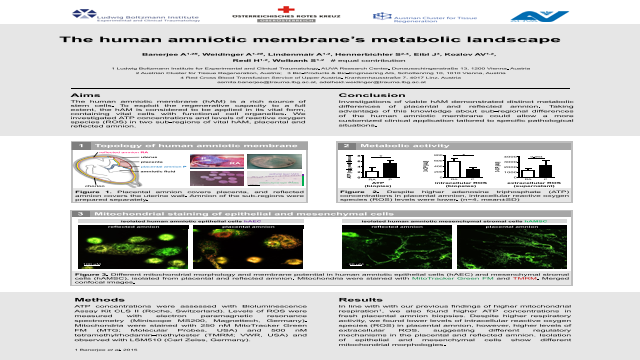 Investigations of viable hAM demonstrated distinct metabolic differences of placental and reflected amnion. In particular, increased glycolysis and higher contents of succinate dehydrogenase in placental amnion could be an indication that these cells have a higher ability to adopt their energy metabolism according to the energy “supply and demand”. This could be an advantage, as the site of injury usually represents a harsh microenvironment with high degree of inflammatory factors, immune cells and hypoxia. Taking advantage of this knowledge could allow a more customized application of the hAM.